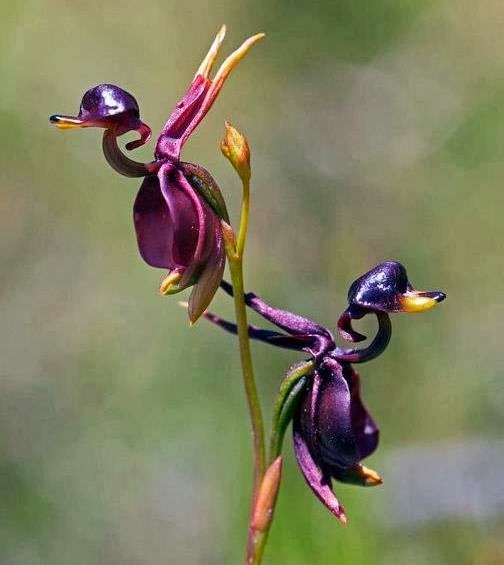 If you have never come across the Flying Duck orchid before then you can be forgiven for thinking that it is a photo-shopped fake. But I kid you not, the Flying duck orchid - Caleana major is a genuine species of small orchid, however because of the small size, it is very difficult to spot in the wild. 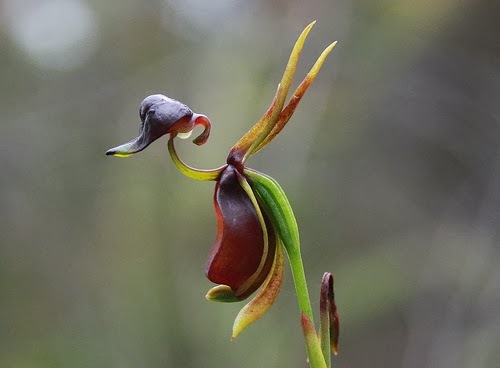 The Flying duck orchid is native to eastern and southern Australia, and even then it is only found in eucalyptus woodland, in swampy shrub and heath land by the coast. Each reddish-brown flower is 15 to 20 mm long, although in rare cases, the flowers can be greenish with dark spots. They are produced from September to January. As you can see in the main image this terrestrial plant features a remarkably complex flower, which resembles a duck in flight. The peculiar flower shape as evolved to attract insects, such as male sawflies. From the side, as humans we see the flower as a duck, but the male sawfly perceives the flower as a female sawfly and tries to mate with it. The beak-shaped labellum is in effect a sensitive trap is attached to the main body of the flower. It is triggered by the vibration caused by the insect landing on it. This trap springs down on to it, trapping the insect in place, and the only way out is backward over the pollen. Once it breaks free, the beak-shaped labellum returns to its normal position and in doing so the male sawfly unwittingly pollinates the flower. This as a process known as pseudocopulation. Put simply, pseudocopulation is the name given to a reproductive function for one or both participants but which does not involve actual sexual union between the individuals. Unfortunately it isn't yet possible to propagate the Flying Duck orchid, and this is because its roots have a symbiotic relationship with a specialist fungus only found in its native habitat.